It is remarkable just how quickly a team that was one competent quarter away from the Super Bowl, and still looked like world-beaters two weeks into this season, has so completely fallen apart. Remarkable not for the why of it—injuries have taken out their top wide receiver, top running back, top two tight ends, and top two left tackles—but for the totality of the collapse. The Jaguars are bad, man. The only reason he didn’t bench every single offensive starter, Marrone admitted, was because he didn’t have enough bodies to replace them. So that’s how it’s going. Marrone declared the quarterback competition officially open, though with only Cody Kessler and Tanner Lee on the roster, and the Jags reportedly not seeking to trade for a QB, it looks like Bortles will be under center next week, and for the rest of this season, and thanks to his contract, next season as well. 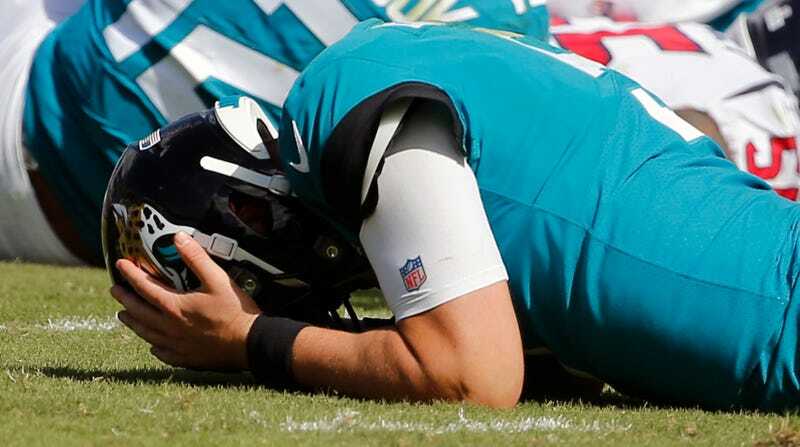 The Jaguars are going to live or die with Bortles, and they are dying. Marrone noted, correctly and painfully, that it’s not as if Bortles played any worse than the rest of his offense. The defense is all too aware. For the last couple of years, Jacksonville’s offense has been its liability, and when that goes on long enough—when a defense is that good and an offense is that bad—it becomes a liability off the field. Defensive players begin resenting their offensive counterparts. We saw it in Seattle, and we’re seeing it in Jacksonville. “Can’t let [opponents] score at all,” DT Abry Jones said, and he sounds like someone absolutely fed up with the state of things. What it is, is a mess. Reporters got to see a split second of what it is when the doors to the locker room were opened following the standard 10-minute “cooling-off period” following the end of the game. Things had not cooled off: As soon as the doors opened, reporters saw DE Calais Campbell physically pulling away DE Yannick Ngakoue from some altercation around the corner, with Ngakoue yelling and cursing and trying to throw off Campbell. The doors were hastily shut again, as the Jags apparently required a cooling-off period after the cooling-off period. It is entirely possible all of this is a blip, that the Jaguars offense will return to being merely mediocre, and that’ll be enough for another deep playoff run. They are only one game out in the putrid AFC South. They should get some of their injured skill position players back before it’s too late. But the underlying issue remains: Bortles is still Bortles, and it’s questionable how much more Bortles the Jaguars can survive.